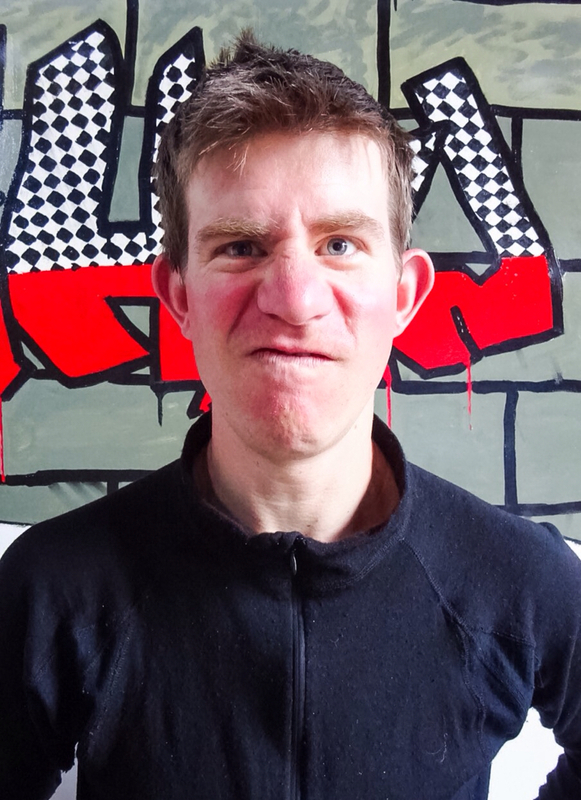 Though Craig is an old, happily married man, he is a strong rider and a helluva fun guy. On this trip, we will refer often to Craig as "Tío Ramón." A few months ago, I recruited another rider for the trip. 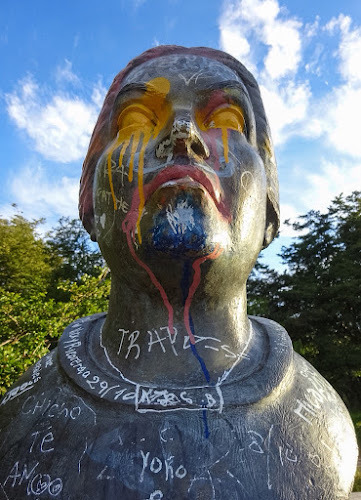 His name is Brian, or "El Mecánico." Brian will wear many hats on this trip -- not only will he serve as the head mechanic, but he will also provide the musical entertainment as well as his exquisite cheffing skills. And so it is, that us three musketeers find ourselves heading to the end of the world. While I intend to blog about this trip, set your expectations low. There will be not be daily posts (as there have been on previous trips), and there will be no polished writing. For one, we'll be traveling through a lot of remote areas that don't have wifi access. For two, I want to focus my energies on absorbing the experience rather than keeping my blog up-to-date. My apologies, in advance, for any formatting and grammatical errors -- I'll be typing on an iPad keyboard while using a clumsy blogging application. Also, I'll only be including photos captured on my own camera. I'll have to gather and post the awesome photos from Craig and Brian's camera at another time. 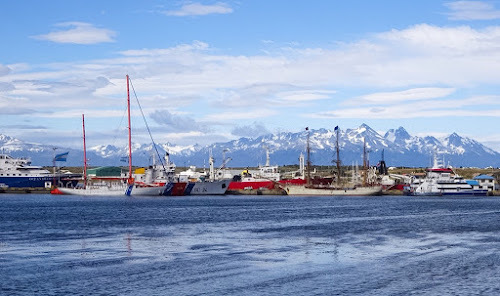 We will begin our trip in Ushuaia, at the southernmost tip of the Southern continent. From there, we will bike through Tierra del Fuego and Patagonia, along the Carretera Austral, and then continue northward along the west side of the Andes. Though our route will take us through some sections of Argentina, we will focus the majority of our trip on exploring Chile. We have no finite destination, though Craig has a return ticket that will get him back home in three months, and Brian and I will be returning home in four months. We'll have our backpacks along with us, and so we plan to partake in a few short backpacking trips along the route. Other than that, our journey is mostly an open book. Brian and I left for the Portland airport at 4:20am. (Many thanks, Jason, for the ride!) We were prepared for the long haul, as our itinerary had us in transit for 48 hours. After a stop and a few hours of layover in Los Angeles, we then flew to Atlanta, where we joined up with Craig for our flight into the southern continent. The next morning the three of us arrived into Buenos Aires. 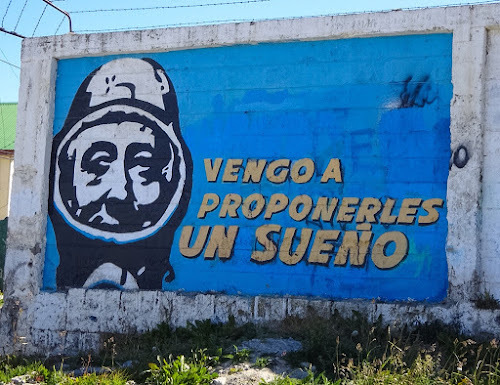 When we booked the flights, we had the option of a 6-hour layover in Buenos Aires (though we would need to switch airports within Buenos Aires during that time) or a 22-hour layover in Buenos Aires (which would enable us to stay at the same airport). Concerned about the possibility of late flights, coupled with the hassle of moving our luggage (including our bike boxes) to the other airport, we opted for the 22-hour layover. Lesson Learned: Opt for the 6-hour layover. We had hoped we'd be able to store our bike boxes at the airport and spend the day exploring Buenos Aires. Upon arriving at the airport, however, we learned that there was no such storage. We also learned that there was a simple (and free!) airport bus that would have shuttled us between the airports. Alas, we called the Buenos Airport home for the next 22-hours. First things first, we picked up our bikes from customs and wheeled those puppies over to the domestic terminal. Damn, what a chore! Especially with such monstrous bike boxes! My very heavy bike box. Of the three bikes boxes on this trip, mine weighed in as the heaviest -- a whooping 69 pounds! My bike alone, including the racks, fenders, and generator hub, weighs just under 38 pounds. 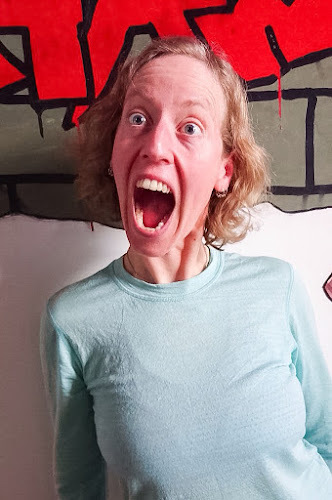 Wowsers, I had no idea Shirley (my Surly) was such a heavyweight! The box and packing materials weighed somewhere between 10 and 15 pounds, and the remaining weight was accounted for by my panniers, helmet, water bottles, and tent, all of which were stuffed into the box. After collecting our bikes, we stopped by the ATM to withdraw some Argentinan pesos. Craig was the first to withdraw money. Intending to withdraw the equivalent of $200, he unknowingly withdrew 200 pesos ($15.10) instead. This withdrawal came with a hefty ATM fee of 82,80 pesos (or $6.25). Thank you, Tió Ramón, for the valuable example of how not to withdraw money from an ATM in Argentina. We then found a place inside the domestic terminal to sit down our bike boxes, our other luggage, and our weary bodies. At Tío Ramon's urging, we fashioned our bike boxes into a little fort. 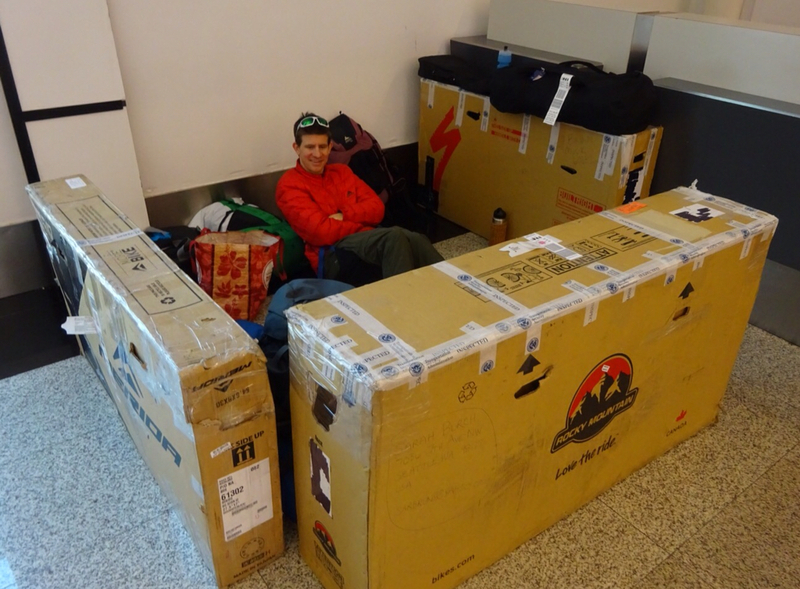 Surprisingly, the Argentinian airport officials seemed to be just fine with our fort. Our bicycle box fort, in the Buenos Aires airport. After awhile, we decided to move our hobo commune to just outside the airport entrance so that we could enjoy the beautiful weather. Tío Ramón, who is spoiled by the Floridian sun, wished the hours would pass more quickly. Meanwhile, as pale and sun-starved Northwesterners, Brian and I thoroughly enjoyed relaxing under the sun. This is the first time we've basked in nice weather since...early October! I read a book, while falling in and out of naps, while Brian played his guitar and fell in and out of naps, too. The shirt was proudly worn by a mother, as her two children played around her. We can only presume that English was not her first language. The next morning we checked in our bags for the final leg of our flight from Buenos Aires to Ushuaia. We had paid Delta the oversize fee for our bike boxes ($150). 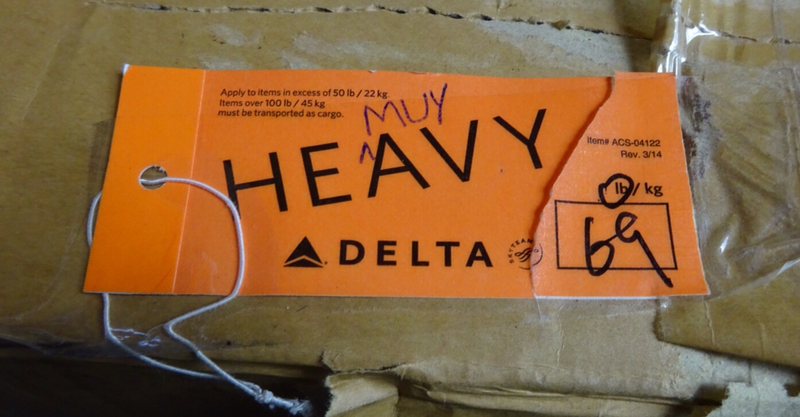 Though Delta assured us that Aerolíneas Argentina, the airline for the final flight in our itinerary, would honor Delta's baggage policy, it turns out they wouldn't. We had to fork over a few hundred pesos more to pay for the extra weight, as Aerolíneas only allows bags to be 50 pounds, and not Delta's 70 pounds. Lesson Learned: Airlines in the US have higher baggage weight limits than in other countries. I was surprised by the size of the plane flying to Ushuaia. The plane sat seven across. Aside from the three of us, the plane was entirely full of the cruise types of folks. After arriving at the airport, we spent a few hours putting together our bikes and packing up our things before heading to our AirBnB, where we would spend the next two nights. Later, we rode our bikes around town and purchased some groceries for the evening as well as some bottles of butane/propane for the camp stoves. Riding around town with the bikes was a bit cumbersome--it would have been easier to walk. Graffiti on a wall in Ushuaia: "I come to propose a dream." 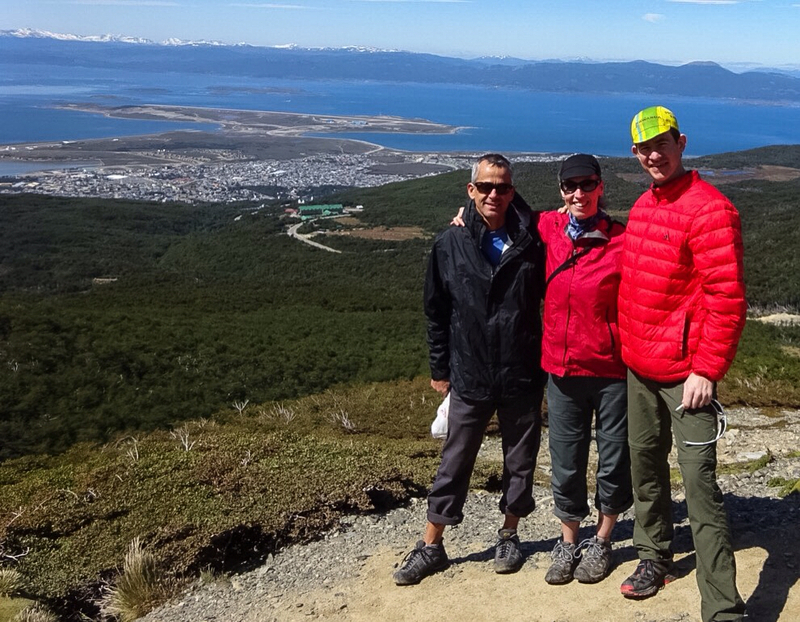 We woke up the next morning and rode our bikes to see Martial Glacier, at the northern edge of Ushuaia. We were able to ride a good distance up to see the Glaciar, but when the road stopped, we needed to travel the rest of the distance by foot. The biking and the hiking were quite welcomed after spending the last few days in airports and on airplanes. Craig, me, and Brian hiking up to Martial Glacier. 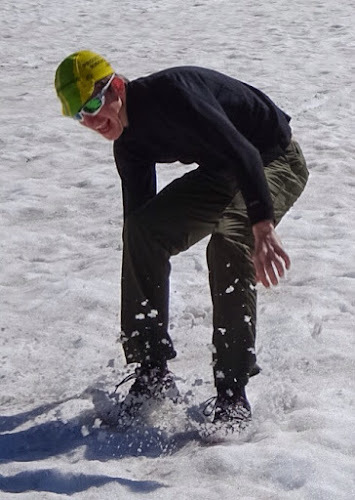 Brian boot skiing on Martial Glacier. 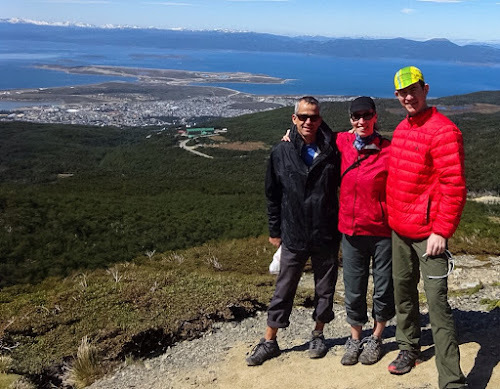 At 1050m, the hike afforded a beautiful view of Ushuaia. With a population of 57,000 people, Ushuaia is the southernmost city of South America, as well as the capital of Tierra del Fuego-- an island which is shared by Argentina and Chile. Ushuaia is bordered by the Martial Mountains on the north and the Beagle Channel on the south. With a subpolar oceanic climate, the city has a very Alaska-like feel to it. 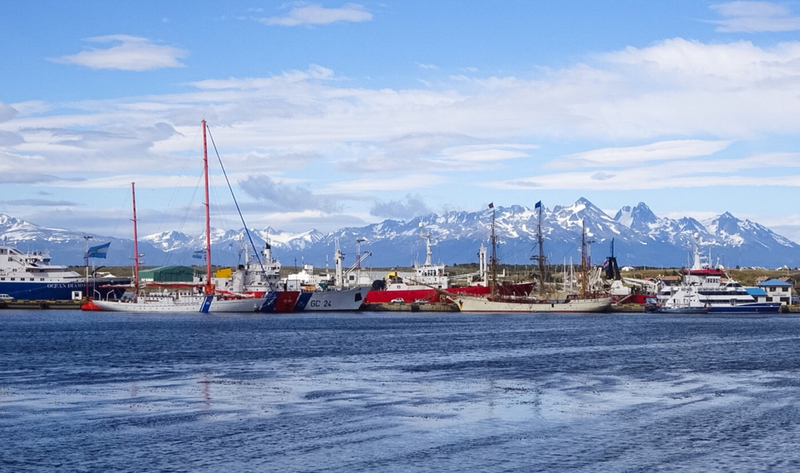 Ushuaia looks a lot like Alaska. Later in the afternoon, Brian and I set out to further explore the city on foot, while Craig did his own thing back at the AirBnB. Brian and I saw a ton of artwork and parks tucked all throughout the town. We were quite impressed by Ushuaia. A man in a boat. That night, we fell asleep with eager anticipation; the next morning we would finally set out on our bike journey! Thanks! 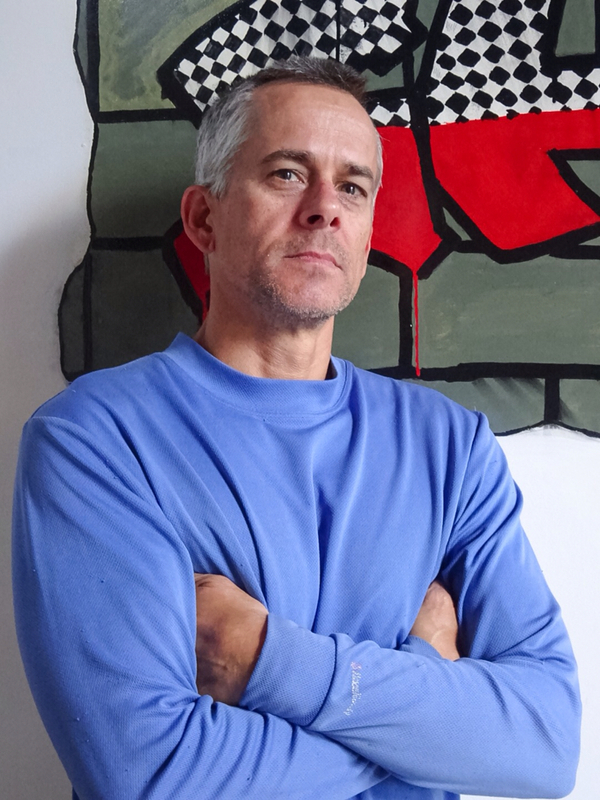 Glad to have you following along! Yeah for the pedaling part! Love the update Sarah! Great writing, can't wait to read along with your journey! Saracita - What a great adventure you are all on! So excited for you! Delinda :) PS...and thanks for that priceless translation of "pedo" LOL!!!! Not sure HOW I miss this post! Love the fort and I never learned that phrase in College spanish! SO very proud of you muskateers! P.S. Hate to break it to you, but there were A LOT of valuable phrases we didn't learn in school. No wonder I almost failed Spanish! Wow - looks like a great trip! Thanks, Bruce! 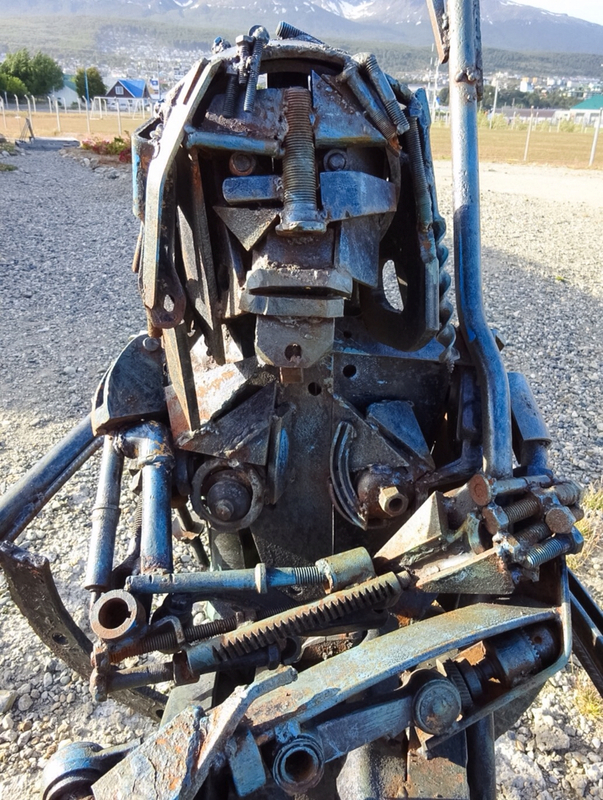 Sorry we missed you when we passed through Punta Arenas.